As fast as my fingers will fly (I was busy getting you flowers, see? XOXOXOXO). Here are some restaurants to consider with Valentine’s dining specials. In no particular order…..
Ristorante Nicola and Nicola’s Ristorante Italiano are offering special Valentine’s dinners. Mama Mia! That’s amore! Nana in the Hilton anatole, has a special four-course menu for $99 per person that includes a glass of Moet & Chandon Rose Imperial Champagne. Early seating begins at 5:30 and hotel special rates. Call 214-761-7470. Say goodbye to Morton’s Dallas downtown. Valentine’s weekend is it for the iconic steakhouse. They will be closing their doors afterthe last Valentine’s Day diner is served, and opening their brand new Uptown location on February 24th, at 2222 McKinney (this is where Grotto was for about 20 minutes–across from the Ritz-Carlton). Phone 214-741-2277 for Valentine’s res. The number will stay the same. Oh, speaking of the Grotto (the original and real Grotto), Morris Salerno’s popular spot in Highland Village has a special Valentine’s menu with music. Call 972-318-0515. Remember, tickets to Savor Dallas will increase your love quotient exponentially. Extend the romance and join the fun March 18th and 19th. It’s something you both will enjoy. Scroll down for previous Valentine’s suggestions posted a couple of days ago. And, for some great Valentine’s wine suggestions, and the secret to pairing chocolate with wine, read on! 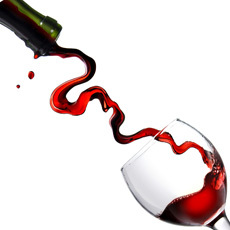 Popular online wine site Snooth provides their list of the top 10 wines for Valentine’s. And, Bottlenotes reveals the secret to pairing wine and chocolate. It’s (supposedly) an aphrodisiac and it goes with wine–if you make the right picks. With Valentine’s Day coming up, the rush is on to grab some flowers, Champagne, strawberries and chocolate. If your better half is truly serious about wine and chocolate, however, pairing the two takes just a tad more thought than a Hershey bar and a bottle of four-dollar red wine (though that’s a start). With that, here’s our quick guide to pairing wine and chocolate. You don’t drink Sauvignon Blanc with steak, do you? Or drink Napa Cabernet with whitefish? Light with light, heavy with heavy. If you like drinking Merlot, get a Merlot. If you like Champagne, get Champagne. Don’t overcomplicate things by buying a wine you’re not certain you’ll like, but that someone suggested might pair well with chocolate. Go with what you know. Go back to Step 1: Don’t pair a light, milk chocolate with a heavy wine or a 90% cacao chocolate with Vinho Verde. So think about your wine choice and how rich and powerful it is, then make your chocolate choice. White chocolate pairs nicely with Champagne, as does very light milk chocolate. If you like Pinot Noir, get a slightly darker chocolate. Merlot, darker still. Cabernet, super dark and rich. At the most decadent end of the spectrum, pair a nice Port with dark chocolate truffles. Or, just get some good advice in the wine or chocolate shop.